No, I’m not gonna start belting out “With a Little Help from My Friends” like Joe Cocker – or even the easy version as sung by Ringo Starr on the Beatles’ “Sgt. Pepper” album. I could if I wanted to, but I don’t want my friends in the office to throw things at me. The song simply came to mind after New Horizons Habitat for Humanity Executive Director Joel Kellam dropped by this morning to take a look at the trailer which New Horizons donated to the Fuller Center to replace the one destroyed in the June 7 Fuller Center Bike Adventure team’s van crash in Idaho. The trailer is looking spiffy. 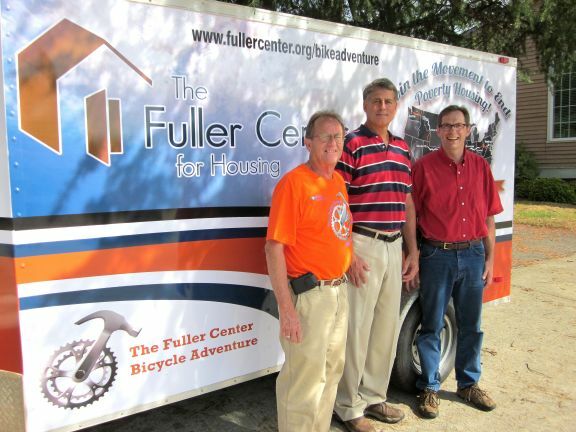 Fuller Center guru of graphics Richard Aguirre came up with the design to draw attention to the Bike Adventure’s mission – which is to raise funds for and awareness of our fight against poverty housing, for those of you just tuning in. What happened in Idaho could have been devastating. However, we only had one serious injury, a dislocated shoulder. (Tom! Keep up the rehab, so you can join us again!) What sprung from the near-tragedy was a good bit of publicity for our mission and a flood of support from friends, including our friends at New Horizons. When it comes to making the world a better place, we’re all in this together, and the way Joel and New Horizons stepped up to the plate to help has not gone unnoticed. To see more photos of the trailer, click here. Meanwhile, I apologize if I got “With a Little Help from My Friends” stuck in your head. If it makes you feel any better, David and Sheilla Snell are “On the Road Again” as they’re dropping off the trailer in Colorado.